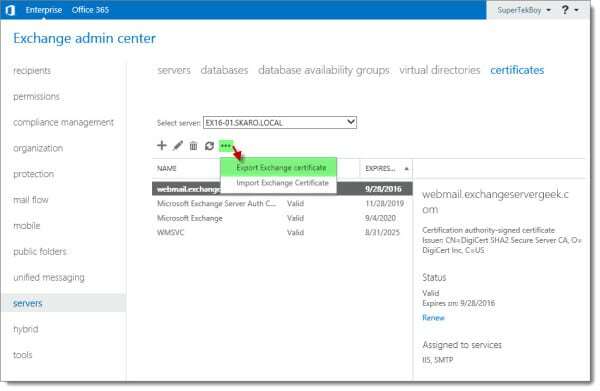 If you have multiple Exchange servers it is imperative that each server have a valid 3rd-party certificate reflecting the namespace. If you don’t some client connections will get certificate errors. In our example below we have two Exchange 2016 servers behind a load balancer in a single site; EX16-01 and EX16-02. Our third-party (affiliate) certificate request was generated and completed on EX16-01. We have also assigned services to that certificate. However, that certificate does not yet exist on EX16-02. 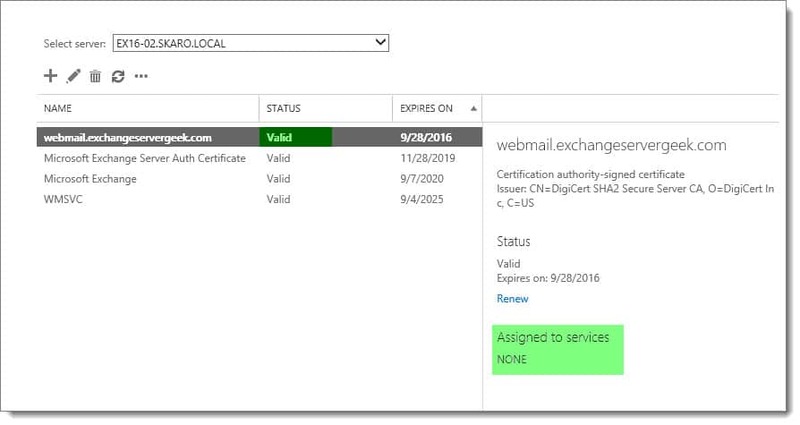 Only the default out-of-the-box certificates exist on EX16-02. When user Amy Pond connects she is load balanced to EX16-01 which has a 3rd party certificate. The certificate matches the namespace. Her connection is established without error. On the other hand, when Rory Williams connects he is load balanced to EX16-02. EX16-02 returns its self-signed certificate. This certificate does not match the namespace. Rory receives a security error. 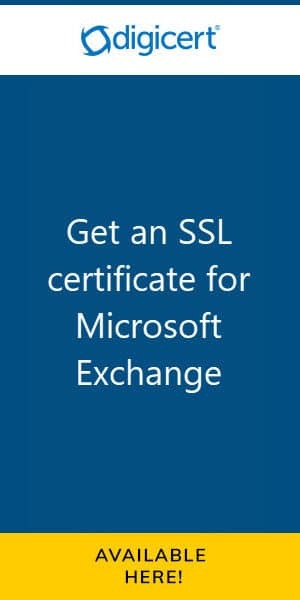 In this article, we explore transferring a third-party SSL certificate from one Exchange server to another. 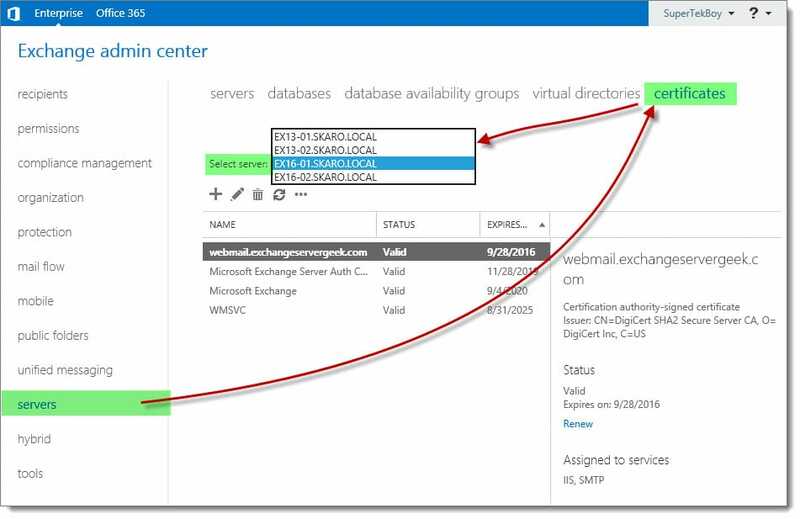 We explore this process through both the Exchange Admin Center and PowerShell. Log into Exchange Admin Center. It doesn’t have to be the server you created your request on. Navigate to the Servers tab and Certificates sub tab. 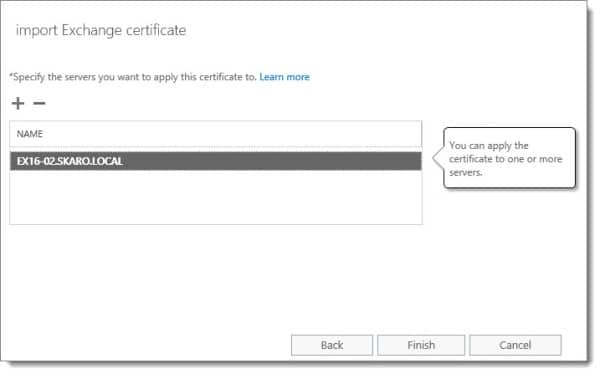 In the Select Server drop-down, pick the server you completed the certificate request on. In our example, this was EX16-01. With the certificate selected click More ( ) >> Export Exchange Certificate. 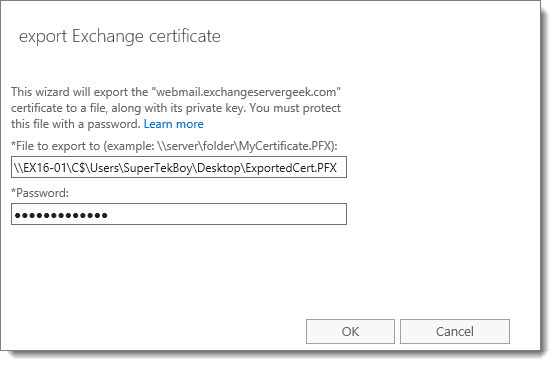 In our example, we selected the webmail.exchangeservergeek.com certificate. On the Export Exchange Certificate dialog specify a path for the export. This will need to be a UNC path and a PFX file type. In our example, we saved this to the desktop of our server – \\EX16-01\C$\Users\SuperTekBoy\Desktop\ExportedCert.PFX. You will also need to specify a password. I recommend making it something long and cryptic. Should this file ever fall into the wrong hands we want to make it as difficult as possible to retrieve that private key. Click Ok. It will take a few seconds for the key to save to the location specified. The export process via PowerShell is a little more involved. The command Export-ExchangeCertificate uses the thumbprint of the certificate versus the friendly name. This means we will have to run Get-ExchangeCertificate to list all our thumbprints. If you are not on the server where you completed the original certificate request you can add the -Server parameter. For example. Now that we have our thumbprint we need to run Export-ExchangeCertificate. 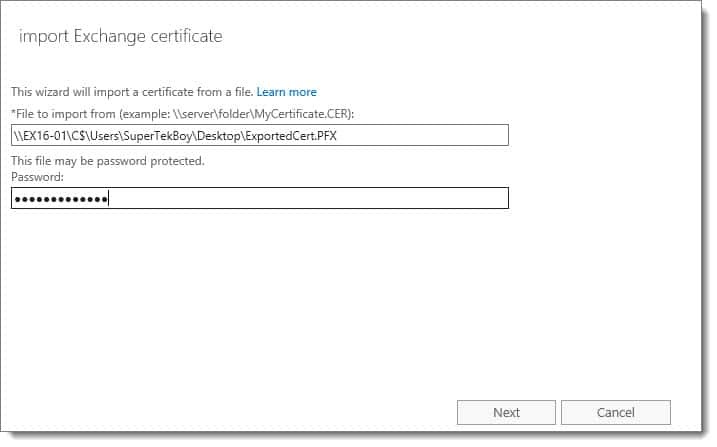 Microsoft requires us to export the certificate through a variable. More info on that here. -Thumbprint specifies the certificate we are exporting. -BinaryEncoded specifies Base64 or DER encoding. $true defaults to DER encoding. -Password specifies the password to protect the file. Let’s export the data from that variable into a file. For this, we use the Set-Content command. This should immediately create a file at the path specified. Unlike the Exchange Admin Center, you can use a local path here versus a UNC path. For example, C:\Users\SuperTekBoy\Desktop\ExportedCert.PFX. Now that we have our exported certificate let’s move to importing. From the Certificates tab, click More ( ) >> Import Exchange Certificate. On the Import Exchange Certificate dialog specify the path to the PFX file we created earlier. In our example, we had saved this to the desktop of our server – \\EX16-01\C$\Users\SuperTekBoy\Desktop\ExportedCert.PFX. Enter the password you specified in the previous section. Click Ok.
Next, specify all servers you want to import this certificate to. To do this click the Add ( ) button. On the Select Server dialog, pick your server and click the Add button. To remove a server click the Remove link to the right of its name. Click Ok. In our example, we will just be importing to EX16-02. Once completed your certificate will be displayed as Valid in the Status column. 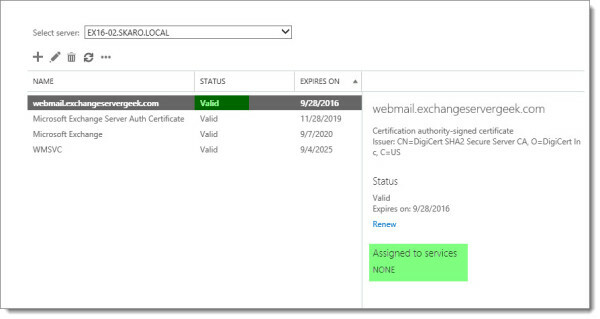 Keep in mind that you will still need to assign services to the certificate before it will be live. If you prefer to import with PowerShell we need to use the Import-ExchangeCertificate command. -FileData calls the Get-Content command. -Path specifies the location to the PFX file. -Password specifies the password to open the file. If successful you should receive an output similar to that below. For security reason you need delete certificate from EX16-01 and import it again from pfx file. This procedure will clear “Private key exportable” flag, and malicious user can’t access it’s private key even if this server would be compromised.